Erect, much-branched summer annual that may reach as much as 10 feet in height. Coffee senna is primarily a weed of agronomic crops that is found from Pennsylvania to Iowa and south to Texas and Florida. 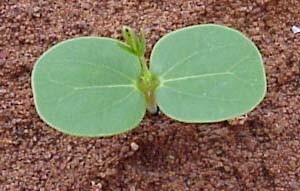 Cotyledons are broad and round, without hairs (glabrous), and have distinctive veins. Arranged alternately along the stem, ranging from 8 to 12 inches in length. Leaves are divided into 8 to 12 leaflets per leaf which are arranged oppositely from one another. Each leaflet ranges from 1 1/4 to 3 inches in length and from 3/4 to 1 1/4 inches in width. Leaflets are ovate to ovate-lanceolate in outline with a long, tapering point. 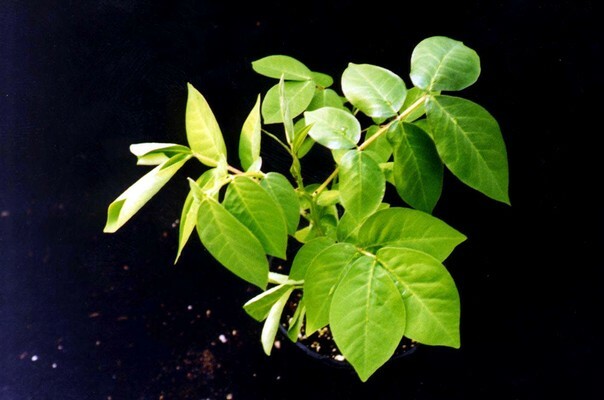 Leaves have petioles that are from 1 1/4 to 2 inches in length. 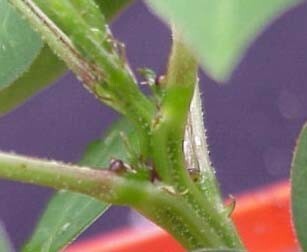 Leaves also have a distinct spherical gland that is 3-5 mm from the base of each petiole. Occur in the axils of the upper leaves or borne in few-flowered racemes. The flower petals are yellow, 1/2 to 3/4 inches long. A long pod (legume), straight to slightly curved, from 3 to 5 inches in length, without hairs (glabrous) or minutely pubescent. A taproot and fibrous root system. 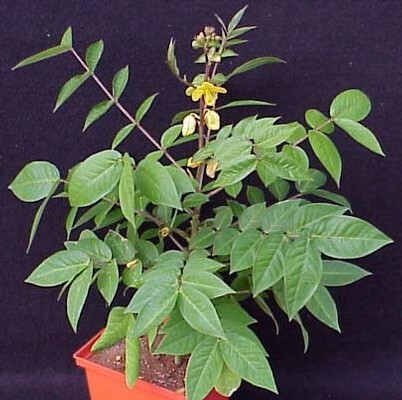 The leaves that are divided into many ovate leaflets and the spherical glands near the base of the leaf petioles are both characteristics that help in the identification of coffee senna. 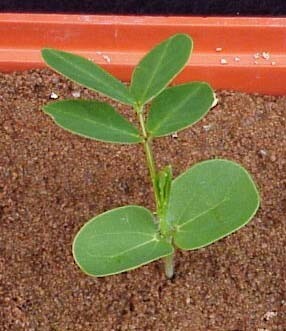 This weed is similar to Sicklepod (Cassia obtusifolius) in growth habit and appearance, especially during the seedling stage. 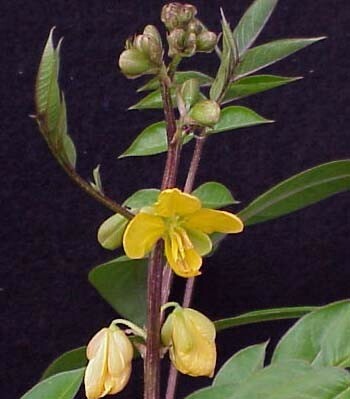 However, the leaflets of coffee senna are more numerous and pointed when compared to those of sicklepod. 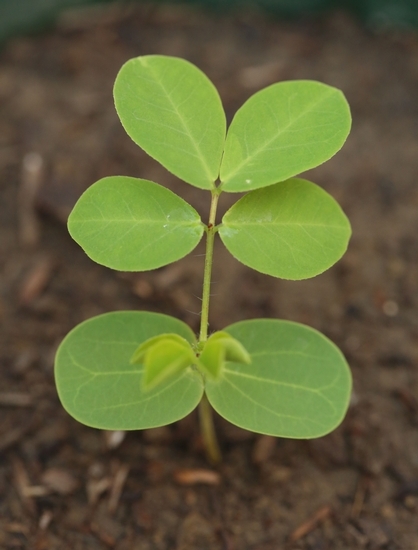 The seedlings of Partridgepea (Cassia fasciculata) are also similar to those of coffee senna and sicklepod. 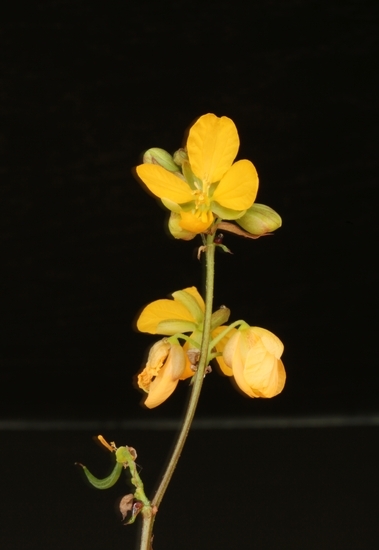 However, with maturity the leaflets of partridgepea are much narrower and more pointed than those of coffee senna.